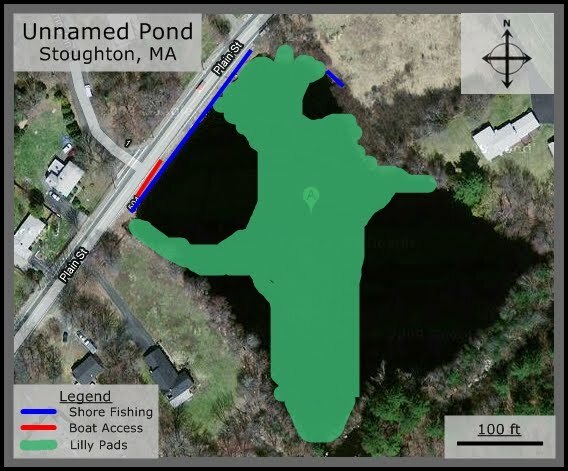 I used to think this was unnamed until a reader informed me that it was called Denison Pond. Anyway, this pond on Plain St just down the street from the world renown Town Spa, is small but definitely has a good amount of fish in there if you can get them to bite. The weeds are pretty thick but there are some big openings in the weeds that you can work with any type of lure. I've only fished this pond from the shore because it just isn't big enough to warrant the effort of getting a boat in there but I guess if you had nothing better to do, you could put a little canoe or kayak in it. There are often breaks way out in the eastern corner where I heard the fishing used to be great before all of the bushes made it impossible to get to. Anyway, there is plenty of room along Plain St to fish from the shore. I've fished here several times and usually catch at least one bass but one day I was very surprised when I pulled out a 2.5 pound bass from this tiny pond. The fishing spots may be limited by the weeds but apparently there are some decent sized fish in there, at least one that I know of for sure at. This is pond is often a big tease as well. You will constantly see fishing moving out in the middle of the water but no matter what you cast out to them, often times they won't take the bait. Which tells me that they are either too small to be interested or the pond has been over-fished and they're no longer interested. But hey, if you decide to go out and fish it for a little bit, good luck! Successful Bait: Worms- Pumpkin seed, Frogs- Dark Green. Spinner bait- yellow skirt. What kind of license do I need to go fishing? Just your typical fresh water fishing license.